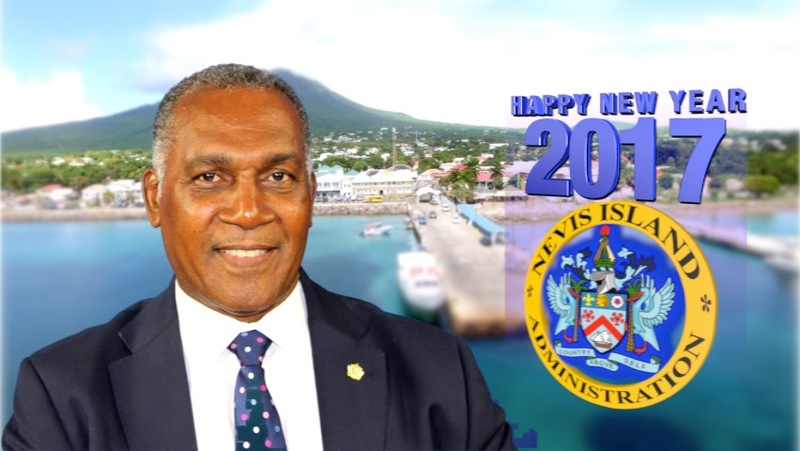 NIACHARLESTOWN NEVIS (January 01, 2017) – The following is the full text of his New Year’s Day Message from Premier of Nevis Hon. Vance Amory. I greet you at the dawn of another year, wishing for you a peaceful, productive and secure New Year 2017. Twenty sixteen (2016) has passed and I take this opportunity to thank all for the sacrifices they have made over the past year. Through your diligence and sacrifice, you have inspired many and you have ensured that our island registered growth in every respect. As we usher in the New Year, let us remember to give thanks to the Almighty God, who throughout the year, spared us the ravages of natural disasters. Let us also pray that his rich blessings and protection will continue to protect us in the upcoming year. For many of us, the new year is a time when we reflect on our achievements over the past year. For others, it is a time of resolution, when we resolve to be better, happier and make improvements in our lives. In the new year, I trust that all of your resolutions will materialize and that you will soar as high as the eagle and shine as bright as the sun. In the year ahead, my government resolves to continue in its effort to provide a government of partnership, in order to ensure political and socio-economic development and stability. We recommit ourselves to providing prosperity through job creation and business expansion. We will spear no effort in continuing to provide an environment which will give all our people the opportunity to realize their dreams and their full potential. In the New Year, we will continue to embrace our responsibility of caring for the elderly, the sick, indigent and for our young people. We will challenge ourselves to improve the overall quality of life as reflected in infrastructural development, health services, housing, crime reduction and education among other things. In 2017, the task before us is quite clear. As a government, we must address the new concerns that have arisen, while remaining steadfast in our commitment to putting our island on a development path of inclusive and sustainable growth. At this juncture, let me express heartfelt thanks to all the citizens and residents who, throughout the year, continue to inspire us with their diligence, creativity, ingenuity and God-given brilliance. I think here of our sports men, musicians, scholars, public and private workers, who gave us their best in 2016 and proved to us that with hard work and dedication, anything is possible. Fellow citizens, in 2016, every index of material life and development showed signs of improvement. Education, health, job creation, poverty reduction, tourism and physical infrastructure have all accelerated and improved. the procurement of a 2.5 mega-watts generating set for the Prospect Power Station to ensure that our people continue to have reliable electricity services. With 2016 behind us, I look to the upcoming year with great hope, enthusiasm and anticipation. In 2017, we should feel more confident about our country and our prospects. It is my firm belief that our best years are ahead of us. Let us therefore learn from the past and work and pray for a better and brighter tomorrow. During the new year, I can assure you that there will be challenges and our maturity and resilience will be tested. However, with our individual and collective efforts, we will overcome the challenges of the future and create a resilient society replete with hope, peace and justice. On Wednesday 30th November, 2016, I delivered a budget which was received well by most of the people of this country. The budget was geared towards revitalizing skills and development and entrepreneurship for economic success. In the Budget Address, I indicated that in 2017, my government will continue to give focused attention to our island’s physical and economic infrastructure. On this New Year’s Day, I pledge that we will provide a more productive, competitive and robust economy. As a Government, we are also committed to providing a more equitable and just society and a more equitable and economic social order. – The construction of a $6 million new berthing facility at Jones Bay, which will enhance the Water Taxi Service. Fellow Citizens, 2017 promises to be an exciting year also for the Private Sector direct investment on the island. Your Nevis Island Administration, has already made significant progress in attracting three upscale hotels to the island of Nevis. We have received the proposals from serious developers and here, I speak of the Northern Point Resort Development at Potworks Estate, which will be a high end resort with an estimated construction cost of US$160 million with a capacity of 150 rooms upon completion and the ability to hire some 200 people here in Nevis. I speak also of the OASIS Resort, another upscale resort with an estimated construction cost of US$40million and it is expected on completion to provide jobs for over 100 people here in Nevis. The Spring Air Condominium Resort Development at Spring Hill Estate, is the third resort and will consist of 150 Rooms. The development will have all of the amenities of a high end, high quality tourism resort and we welcome and thank all of these investors for their invaluable contribution to tourism and the development of the economy of our island. Fellow Citizens, we will go into the new year confronting some deep seated social challenges, ones that have been blighting our country for far too long. Chief among these is the issue of crime. Fellow citizens, crime and violence is proving to be the biggest challenge of our age and perhaps the biggest our nation has faced in a very long time. Twenty Seventeen (2017) will be a year when our mettle will be tested. In this ensuing year, my Government will redouble its efforts in conjunction with the Federal Government to ensuring the safety and security of the people of Nevis and the people of the Federation generally. However, we cannot successfully do it without each and every one of you. Crime fighting is not a government issue alone. It is a community and a national issue. We need all hands on deck. The police and every citizen of this Federation, is needed to accomplish the eradication of crime and violence from our midst. This is the year we must speak with one voice, regardless of our political persuasion and condemn all acts of violence. As one Latin proverb says, “Silence is the voice of complicity”. As law-abiding citizens, we must never succumb to the silence of complicity and allow our indifference to embolden the criminals. United, we must work together to ensure all of our economic and social gains are not lost, and make Nevis and make our Federation, generally, a safe place to live, visit conduct business and to raise our children. Clearly, there is a nexus between the increase in crime and the abandonment of family values. I urge you our parents, to strengthen and rekindle your bond with your children. Learn to discipline them. Learn to show them and teach them what is right and what is wrong. Tell them and show them that you have love and care for them. Expect and demand the very best from them. When necessary, be strict but counsel and discipline them. Fellow citizens, courtesy, good manners and values are still useful and applicable today. Instil in your children respect for authority and the sanctity of life. By practicing these inexpensive yet precious qualities, your children, our children will fare well and lead successful lives in the future. Our Education system has proven to be the envy among our Caribbean neighbours. In the past year, we adopted the theme “Investing in Quality Education: Empowering the Nation”. This theme underscored the significant investments that was made during this school year, as we seek to empower our students and provide avenues for improved learning outcomes. I am happy to report that 2016 proved to be a historic year in our education system. It provided us with a range of academic successes unlike any other period in our history. Of note, is the fact that for the Sixth Form, Caribbean Advanced Proficiency Examination (CAPE), Orian Stapleton was 1st Runner-up and Kamil Wilkin was 2nd Runner-up for State Scholars. At the Caribbean Secondary Education Certificate (CSEC), Rol-J Williams of the Gingerland Secondary School had the most outstanding performance with 17 distinctions from 17 subjects sat, with Ronicia Liburd of the Charlestown Secondary School tying for 1st Runner-up and Anneka Ferguson of the Gingerland Secondary School as 3rd Runner-up in overall performances for the CSEC examinations in our Federation. In short, our CAPE students were 2nd and 3rd in the Federation while at CSEC, they were 1st, 2nd and 3rd. This was an exceptional performance on the part of our students. The challenge for us and for our students who are coming forward in for the next years is for them to emulate that level of performance. We have set the bar and set it very high and it means that our children, our parents, our teachers and our whole community, the Department of Education, our Ministry and Minister of Education who will have to ensure that we continue to perform and provide good quality education and good output for our education system. Let me congratulate the teachers and the students at our two Secondary Schools for their phenomenal performances. I however, challenge them to do more. The question may be, do more of what? More of becoming greater role models to our children. Interacting with them outside of the classroom to ensure that they focus on becoming good citizens. We challenged you to use the tools of education to develop better citizens, communities and a better country. You have responded with great academic focus, decisiveness and discipline. The Nevis Island Administration, therefore, will continue to advocate and provide education for all. We will continue to acknowledge education as a sword for the weak and a shield for the defenceless. Fellow Nevisians, let me on behalf of the Nevis Island Administration and the people of Nevis, also congratulate all Nevisians who participated in Sugar Mas 45 but let me also congratulate all of the participants in Sugar Mas 45. I am aware that it is not an easy task for anyone to enter competitions whether it be for carnival, for school concert, for Culturama, for any sort of competition and it must take of you and from you a lot of commitment and a lot of dedication. All of you have performed with great distinction and you are an inspiration to all of us and special mention must be made of Mr Dysil Hamilton who had what can be termed as a ‘double delight’. He was crowned Mr. Kool 2016 here in Nevis and Mr. GQ for Sugar Mas 45 in St. Kitts and secondly, the Mighty Invincible who was crowned King in the Primary School Junior Calypso competition. Third, the Mighty Sookie who was 1st Runner up in the Secondary School Junior Calypso Competition. It is with enormous pride and satisfaction, that I can congratulate each of you but I also have not only been inspired by your performances but you have caused others to be aspired and also to aspire to high quality performance. My. Fellow citizens, I urge you to let this year be a year of progress and prosperity. In 2017, it is our duty to be selfless in all of our endeavours and I ask all of us to put country above ourselves. Let us put aside individual pursuits. Let us think of the collective and work together for the greater good of the country so that as we combine our efforts, we can have a greater output which is greater than the sum of all of our individual efforts. Let us display resilience, strength and determination in all of our doings. It is only by practicing these qualities that we can overcome the challenges that lie ahead. In the year 2017, this new year, let each one of us become an agent of change and become the change we wish to see in Nevis. Finally, we must make the year ahead of us a year to be remembered. We must at the end of it, be able to look back with great pride and satisfaction. Starting today, let us determine what 2017 will be by being kind to each other, respecting each other and treating each other with the dignity each one deserves. Let us care for our young and give them the love and guidance they yearn for. Let us rekindle the community spirit and make volunteering a central part of our activities. Each day do a good deed and be a positive influence to someone. Let 2017 bring out the best in all of us and let the fountains of social and economic wealth continue to flow unabated in our little island paradise of Nevis and throughout our Federation. From my family to you and yours and on behalf of the Nevis Island Administration, I wish every single citizen, every visitor, every resident, a happy New Year. I wish that this year is filled with love, peace, health and prosperity. Let this be the hallmark of our living, of our lives in 2017. May God bless us all. I thank you for your attention and may we all have a wonderful 2017.